Yamaha synthesizers / keyboards. Korg, MIDI Yamaha drum machines RX, DD-50 CP-30 DX-7 DX7 DX-7II, Casio CZ, CTK series, Korg POLY 61 keyboards & Hammond organs, Leslies, Rolands, Casios. 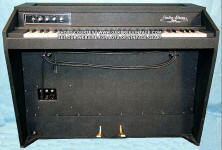 Fender Rhodes & Wurlitzer electric pianos as well as Univox rhythm machines. 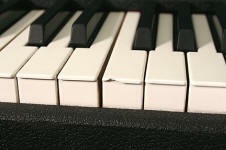 KEYBOARDS, SYNTHESIZERS, PIANOS, MIDI, DRUM MACHINES ETC. The Juno-D comes with 32 MB of waveforms in its memory including Roland's stereo multi-sampled piano, and a whole range of synth sounds from vintage synths to GM2-compatible. Patches are organized in categories such as Piano, Guitar, Orchestra, etc. There are digital resonant filters, LFOs, multi-effects, phrase sampling, chord memory, five front-panel control knobs and a D-Beam controller so you can twist any of the hundreds of patches it ships with into your own more unique sounds. The Roland Juno D 61-Key Synthesizer is packed with hundreds of first-class sounds. You get expressive multi-effects, real-time performance controllers, and tools for groove creation and composition. 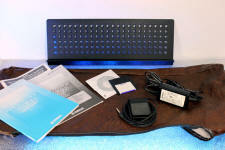 The 61-note keyboard offers 64-voice polyphony and improved feel. 640 top-quality patches with split and layering capability are organized into categories for easy access. 20 rhythm sets, GM2 compatibility. 47 multi-effects. Powerful arpeggiator with 400 templates. Multi Chord memory for one-finger chord triggering; Rhythm Guide metronome. The awesome D-Beam controller offers intuitive sound control and front-panel control knobs enable instant fine-tuning. 2 tones can be assigned to each patch, and then split or layered. The world standard keyboard synthesizer, JUNO-D is reborn. JUNO-D Limited Edition is loaded with a powerful new collection of sounds, including an incredibly realistic piano based on 88-key stereo multi-sampled waves, a massive rock organ, ’80s-era brass and electric piano, and many others. In total, you have the luxury of 706 patches, including 66 of the very latest, all at your fingertips. Lightweight and powerful, this synthesizer boasts advanced features and even greater sound quality. • Powerful new patches featuring 88-note stereo multi-sampled piano, legendary rock organs by Jon Lord, and ’80s Vintage synth sounds. • Patches organized in categories such as Piano, Guitar, Orchestra, etc. 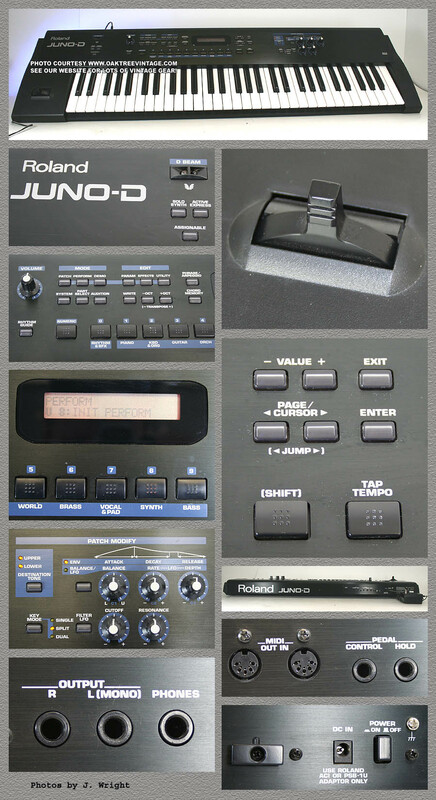 The JUNO-D Limited Edition is outfitted with 706 exciting patches (includes 66 new). 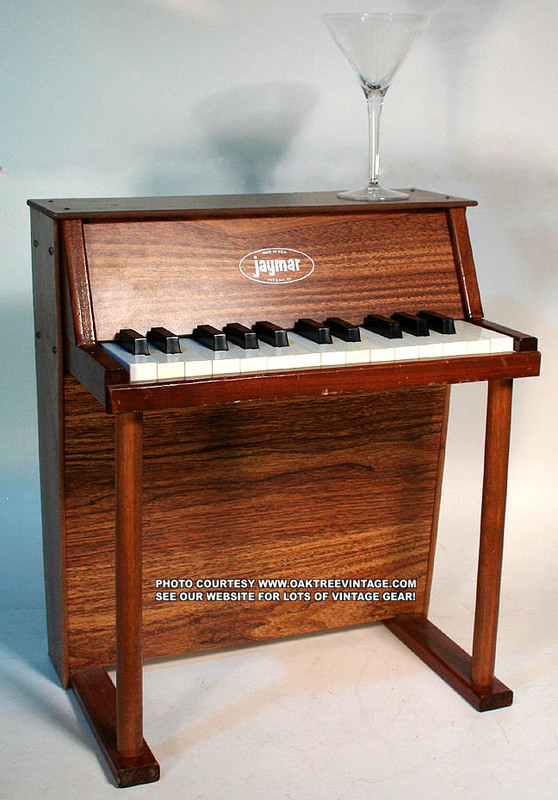 They include a stunningly realistic 88-note piano with individual stereo multi-samples for every key of a world-class grand, sounds sampled from the organ of Jon Lord, the keyboardist of the world-renowned hard rock band Deep Purple, and vintage synth sounds, including '80s-era brass, electric piano, and synth. Forget about MIDI and focus on playing with the JUNO-D. It's loaded with patch category oriented direct-access buttons for selecting among the hundreds of patches. Enjoy the latest sounds, that can be layered and split. Those who want to program their own JUNO-D sounds via computer, an optional Mac/PC editor can be utilized. The JUNO-D is loaded with convenient, performance-oriented features including a powerful phrase/arpeggio generator and Multi Chord memory function, which lets you play a chord by touching a single key. You can assign all 12 notes in an octave to play different chords, and then save them as a set. There are several chord sets already stored in the JUNO-D at the factory. A Rhythm Guide metronome with real drum sounds is also built in, which includes preset patterns with several variations. Performers will appreciate the feel of the improved 61-note, velocity-sensitive keyboard, which is a step up from previous synths in this price range. Bend, twist, and manipulate your sounds in real time with the D Beam controller, pitch/modulation lever, and five front-panel control knobs. For additional control, plug in pedal- and/or footswitches such as Roland’s DP-2, DP-8 Damper pedal, EV-5 Expression pedal, or BOSS’s FS-5U. Parts: 16 * Two Tones can be assigned to each part (Patch), and can be split or layered. Patches: 128 * Two Tones can be assigned to each Patch. Preset Chord Sets: 16 * 12 chord forms are assigned to each set. User Chord Sets: 8 * 12 chord forms can be assigned to each set. This 'One-owner', Roland Juno-D keyboard is in 'NEAR NEW' condition. No issues. Ready to go. Includes an appropriate power supply / adaptor. Stunning sound quality, USB connectivity, full XG MIDI compatibility, and an LCD that displays sheet music! Designed to use the power and expandability of the internet, it features 61 full-size keys with touch response, organ flutes voice with 8 virtual drawbars, pitch bend and modulation wheels, and Music Finder that stores up to 1,200 songs. The Groove/Dynamics function adds serious musicality to auto accompaniments. 3 intros, 3 endings, 4 variations, and 4 fill-ins for every style. It's even multilingual, with interactive help in 6 languages. 32-note polyphony, 16MB of wave ROM, 16-track sequencer (32 tracks over USB), MIDI I/O, floppy drive, 1,524KB flash ROM, onboard effects, internal speakers with 12W per channel, headphone out, 2 footswitch jacks, and L/R line out. The PSR-1100 is compatible with commercially available song data including GM (General MIDI), XG, Disk Orchestra Collection (DOC), and XF. 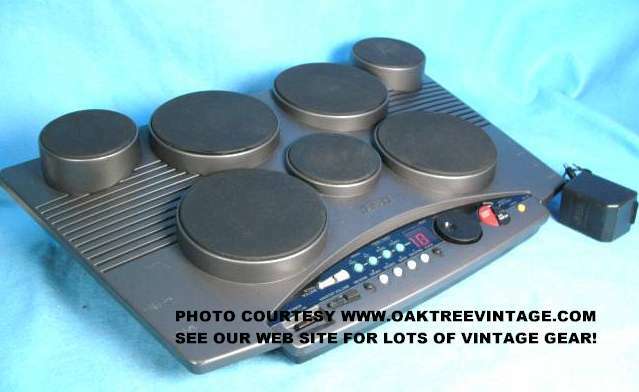 The keyboard comes with 287 voices, 480 XG voices, 16 drum kits and is 32-note polyphonic. Additional features include a selection of special samples called Sweet and Cool! Voices. Sweet Voices are special voices from Yamaha that reproduce all the natural expression and vibrato of their respective acoustic instruments; for example, Sweet Flute and Sweet Trumpet. Cool! 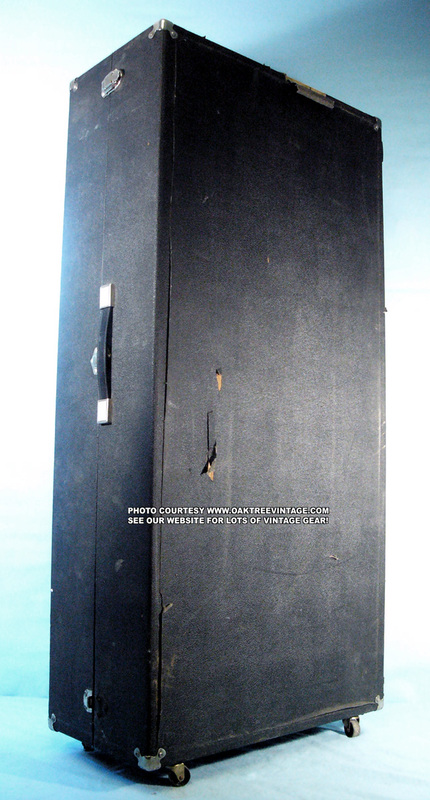 Voices feature samples of electronically amplified instruments like guitar and electric piano. To get the most out of these great voices, there is a Stereo 2-way speaker system with bass ports to extend low end response. And to capture all of this sound, you'll find a built-in 16-track sequencer for recording and editing your songs. And remember, you can save your songs and transfer them via USB directly to your computer for further editing or attaching to e-mail. Finally, to round it all out, there are two Foot Pedal jacks, transpose and tuning, auto harmony for the right hand, metronome and a CD-ROM containing File Utility software and USB Drivers. It's all here. The PSR-1100 features Styles (accompaniment patterns) in a variety of different musical genres including Rock, Jazz, Latin, Country and Dance. All you have to do is play the chords with your left hand as you perform and the selected Style will automatically play along, instantly following the chords you play. This is live playing at it's best. For even greater diversity, this keyboard is the first in the line to offer 4 sections to the built-in Styles. For example, you could use the A section for the Verse, B section for the Chorus, C for the Bridge and D for a Solo. In addition, each Style has 3 different Intros and Endings and will automatically fill, if you like, between sections. This ‘One Owner’, Yamaha PSR-1100 keyboard is in 'NEAR NEW' condition. No issues. Ready to go. 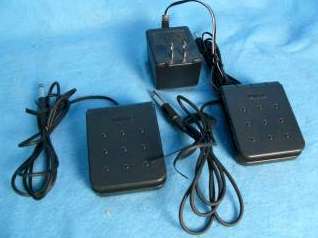 Includes the original Yamaha PA300 power adapter / power supply, expression foot pedal, user manual / paperwork, custom cover, original Yamaha music rack, and original bundled software. 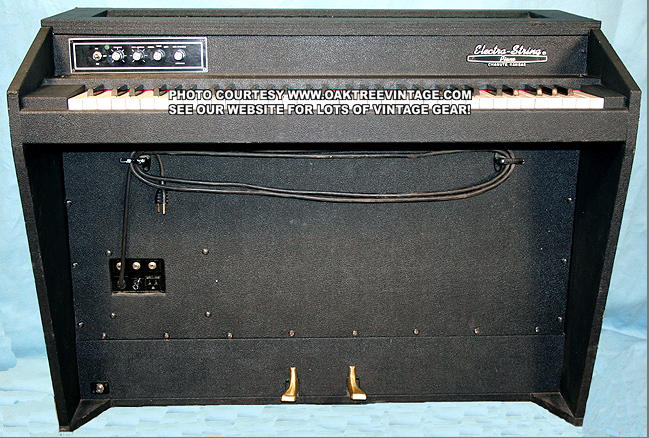 Beautiful looking and sounding Hammond, M3 / M-3, Tone Wheel, Tube powered organ. If you can't afford a B3 or C3 and want to get "THE SOUND" , then this is a great, popular and well known way to do it. They are essentially a B3 / C3 without the tone / EQ presets on the left hand side of the keyboard (that is the "reverse" color keys you see on B3's and C3's.) Without that feature, you simply change the EQ / Drawbars manually for each type of tone. This one has had all the filter caps checked as well as all the tubes checked and replaced with original "Old Stock" US versions where necessary. Original 12", Rola, AlNiCo magnet Speaker sounds great! 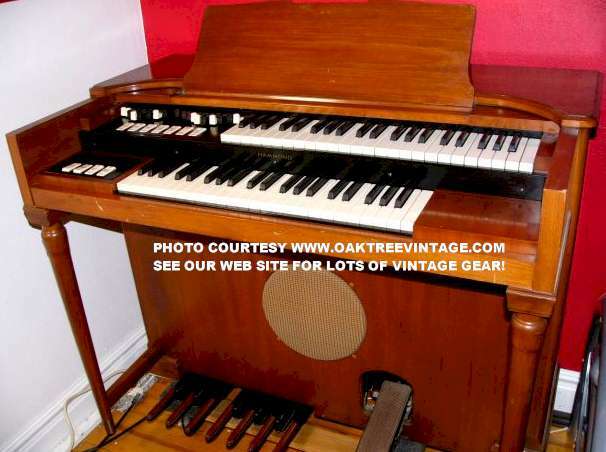 Organ is in great cosmetic and working condition. Only issue is that one of the bass pedals is louder than the rest (we have not pursued that due to assuming most players either aren't going to use them, or are going to "chop" it for road use). Starter and Run motor both perform flawlessly, as does the scanner. Regularly oiled, maintained and ran. It's a blast to play. Keep it the way it is, or "chop" it to take on the road. Would also work and sound great with a Leslie kit installed if you so desire. Runs and sounds great the way it is though! Prefer Colorado Springs located Pick-up, but if you really want, we can help with shipping arrangements, to a point. For the studio that has everything. 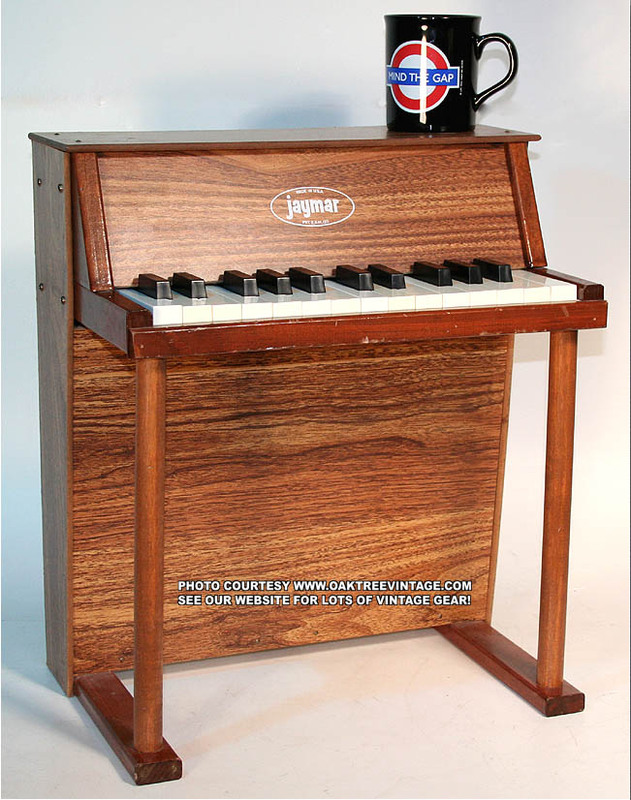 A 25 key model, Made in the USA, Jaymar acoustic child's piano. Perfect for those eerie "Horror / Surreal" sound tracks. This thing is in great condition and plays in well. We checked it with our bench tuner. 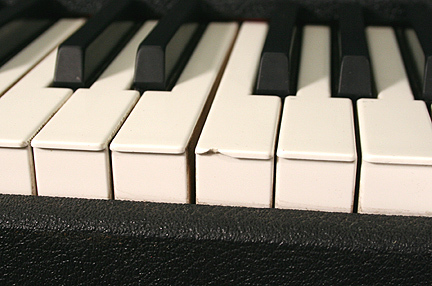 All keys and notes work w/ even volume. As far as note accuracy we found that overall the piano is about a '10 pennies' sharp w/ no glaring individual key / note issues. We removed the tone bar to sound board attachment rivets, added industrial epoxy under tone bar and re-installed using bolts instead of rivets. This increased the transmission of vibration from the tines to the sound board, thus reducing anomalies and increasing volume. We adjusted / moved the entire sound board / tine / tone bar assembly in and up, to play with a "soft-touch" and results in a quicker action and slight increase in volume / output. (originally these 'childs' pianos have action that lends itself to sticking keys when played softly as they were designed for kids to "bang-on"). We also replaced the 'nails' that the sonic critical parts were assembled with screws, which improves sustain and volume. All original. Original vinyl grain wood cabinet still in fine shape. Will record great! Ready to go. Measures 17" wide x ~18" high x ~10" deep and weighs 10 lbs unpacked. Needs some latch work, but functions. I have used this for many Wurlitzer 200 pianos, but have no current need for it. Measures ~44" long w/ wheels x ~21" x 10.5". and weighs about 35 lbs. Will be expensive to pack and ship, so on this one, 'local / Colorado Springs pickup is welcome. 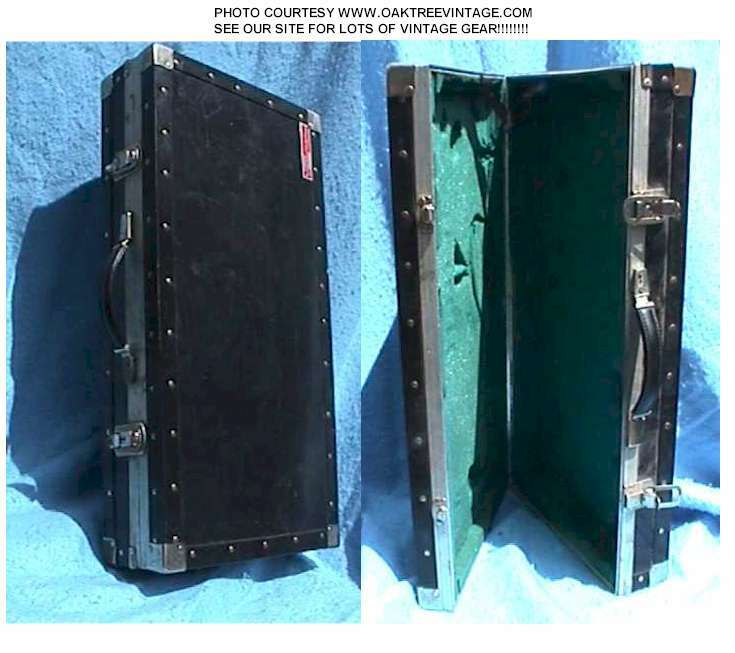 Nice heavy duty road case in good condition. Needs foam lining replaced. Inside measures 27 1/2" long x 13 " deep x 3 1/2" tall when lined with 1" of foam. Thicker or thinner foam would yield different dimensions. Existing foam needs to be replaced prior to use. Foam usually needs to be replaced every 12-15 years due to ozone effects. Outside measures 29 1/2" long x 16 1/2" deep x 6" tall and weighs 12 lbs. Will fit Moog Source. 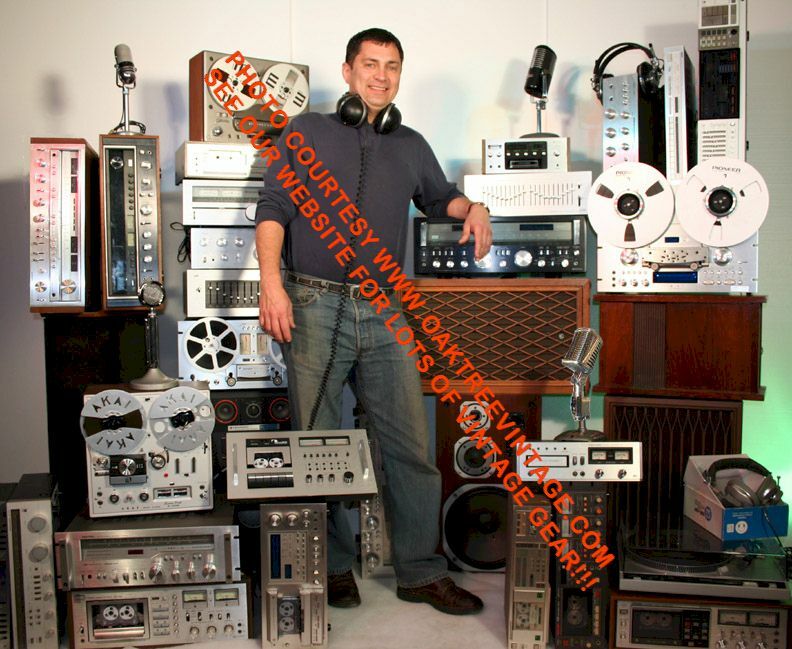 Will probably also fit Micro-Moog, Mini-Moog, Rouge, MG-1, Satellite, DX-100, Poly 800 and probably many others. Check your keyboard for exact measurements. 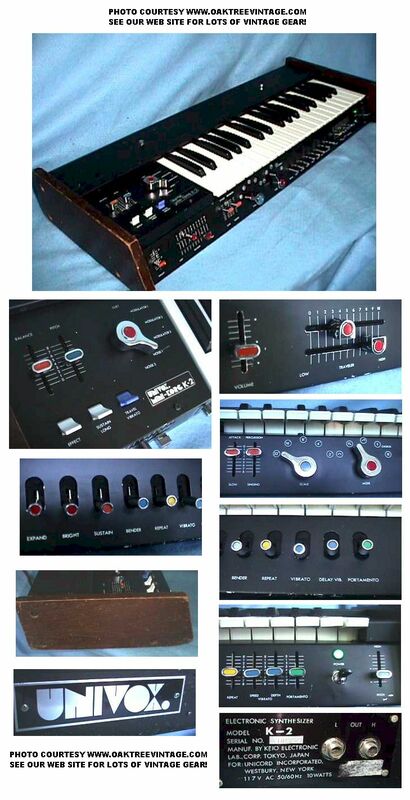 This is one of the most popular drum machines ever made. 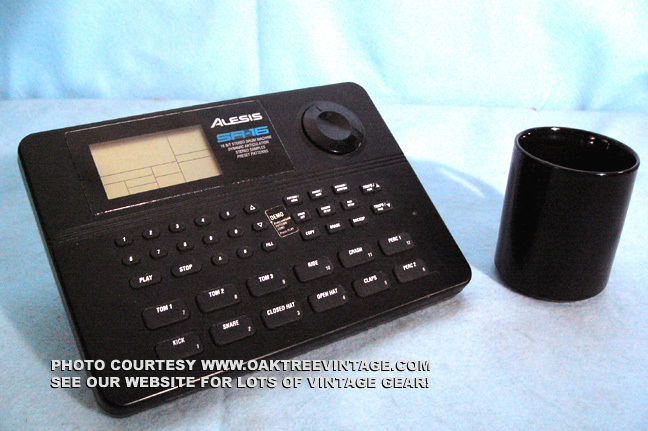 The Alesis SR-16 has been used by everyone from songwriters to live performers to remix engineers as their drum machine of choice. It should say something that it has been a current model since 1991! How many other “digital” devices do you know of that a manufacturer has not seen a need to improve on for 13 years?! The reason is simple: it features a great selection of 233 realistic, natural drum sounds, offered both in dry form and sampled with our incomparable digital reverbs. The SR-16’s Dynamic Articulation™ feature enables a drum sound to change its tonal content as it's played harder for truly realistic performances. The SR-16 features 50 preset patterns that were actually played in by top studio drummers, not just programmed and quantized. You'll find enough built-in rhythmic variations (with A, B and two Fill sections) for composing complete arrangements, and you can create and save your own customized patterns and songs. Plus, the SR-16 also provides complete MIDI implementation, a footswitch input, flexible programming and editing features and velocity-sensitive pad buttons. Plus, it's so easy to use that you'll be up-and-running and composing new music in minutes. Whether you need a songwriting partner or an accompanist for live performance, turn to the all-time world standard in drum machines: the SR-16. Everything is in near perfect cosmetic condition! Entire unit looks near NEW and these things sound great! Very realistic drums / percussion sounds with killer effects! Comes with AC adaptor. Unit measures 9.25" wide x 1.5" tall x 6.5" deep and weighs 2.5 lbs unpacked. Includes our standard 90 day limited warranty. Again these are not “toys”, but a very usable tool for studio, rehearsal, writing, live or for entering drum lines into a MIDI device such as a sequencer or computer. Sorry we don't have a manual, but they are available from Yamaha. Measures 22" w x 14" d x 6" tall and weighs 8 lbs unpacked. Comes with our standard 90 day warranty (not including damage from stick hits). This is a repair kit to repair those worn out, mis-firing Korg Poly, Alesis, Yamaha, Roland and any other brand of drum machine or keyboard rubber key contacts. 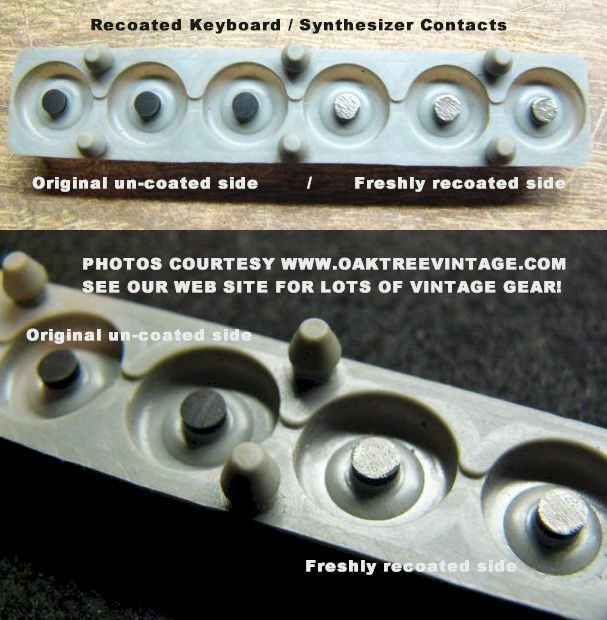 The contact strips themselves are no longer available in most cases, but if the rubber matrix is still intact you can easily do a quality repair on them and get back to making music! Each kit is designed / rated to do over 50 contacts (I recently mixed up a batch and did over 200 contacts, and hardly put a "dent" in the amount in the container. Probably could have done many more (once mixed, compound must be used with-in 72 hours). 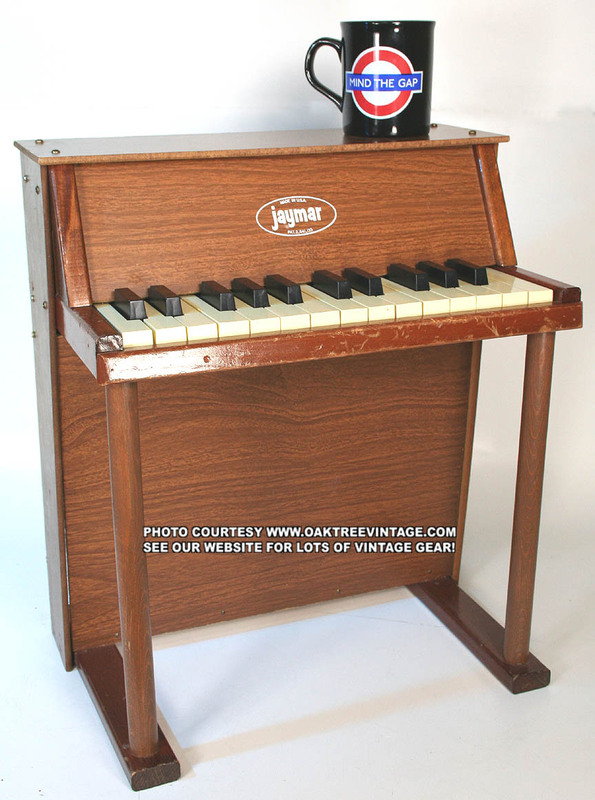 Great for musicians and repair shops needing to resurrect those old keyboards. Use if keys / buttons / switches are making intermittent sound / contact or no sound at all. We have tested this stuff in our own repair shop and it works great. Much to our surprise it also works on keys that transmit velocity or touch sensitivity too. 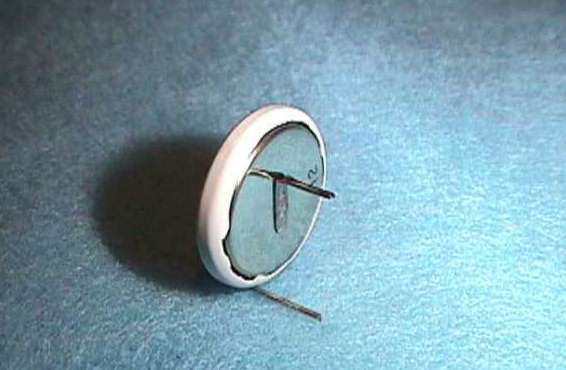 Manufacturer has tested repaired contacts to over 500,000 keystrokes and they passed. If you've tried cleaning yours, they work for a while but they just keep getting worse, here's your fix. We were amazed at how well this stuff works. We repair all our key contacts using this stuff. Comes with instructions and everything you need. Very un-impressive looking package, with what appears to be little actual contents in containers, but will make up for it in performance! Repair keyboard keys contacts / rubber pads on Casio CT, CTK, CZ, MT, SA, SK, WK, Korg Mono Poly, Poly-Six / 6, T1, M1, Roland "Juno D", A-30, EP, E-70, GW, HP, KR, JP, JV, RD, Roland SH, VK, XP, D20 / D-20, D50 / D-50, E66, E-66, Yamaha AN1X, CLV Clavinova, DGX, EX7, KX, RX, PSR, PSS, SY, Yamaha YPG, YPP, YPR, YPT, Alesis HR-16 16B B SR-16 MMT-8 MMT8 Drum machines, ARP Kurzweil keyboards as well as many, many others. 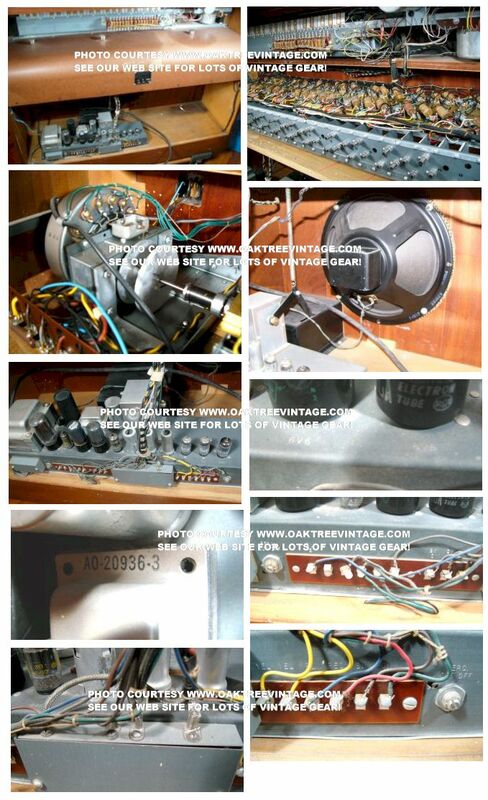 "Aloha Jerry, used the repair kit on my Juno-D. Works Great!! Thanks so much, Michael in Hawaii"
This gentleman was initially VERY apprehensive about this repair kit, and ordering one; "Thanks Jerry, I have completed the repair on my KR-55 Roland keyboard. All keys are working now. It appears the kit worked! I did let dry 24 hours, per your instructions. Thanks again for your help. 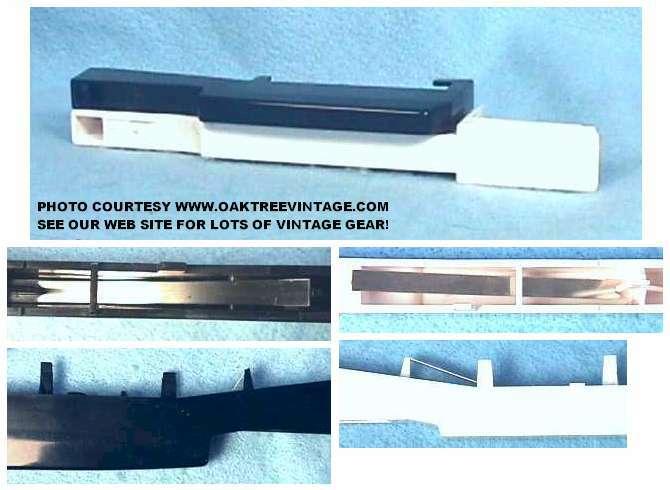 Denny D."
Oak Tree Enterprises, LLC is not responsible for damage due to misapplied, misused product, and our warranty extends only to the extent of replacement of defective product kits. 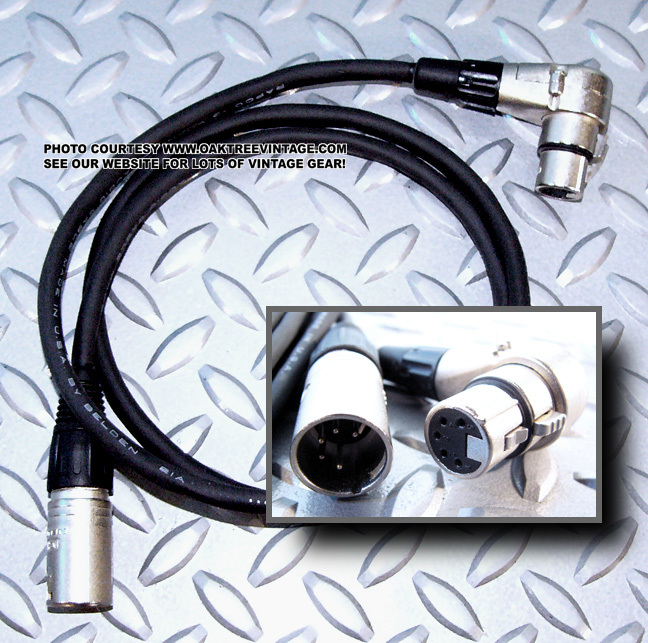 5-pin XLR angle female to straight 5-pin male XLR. These are manufactured specifically for us. They are wired pin to pin as the originals. They are 4' in length and are very high quality cables, with high quality parts and with a "Real" Life-Time warranty against manufacturers defects. Please call for assistance with tines. Key number does not help. We need the length in mm from the point on the mounting block where the tine starts to the tip. If yours is broken we need the length of the longest neighbor. Use a very accurate metric measuring stick for this. STOCK MAY BE A MIX OF USED AND NEW. Front leg top half (less inserts)- $20 ea. 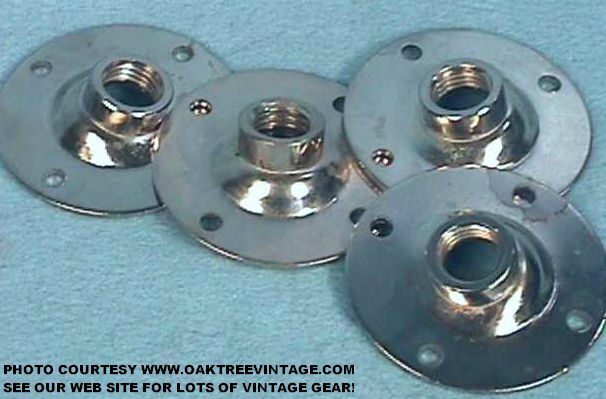 Original New Old Stock Fender Rhodes Leg flanges. Ready to mount on your piano. UNTIL FURTHER NOTICE - WE ARE OUT OF MODEL 200 REEDS IN THE MIDDLE 1/3 OF THE KEY BOARD. WE HOPE THIS IS ONLY TEMPORARY. SORRY FOR THE INCONVENIENCE TO YOU MODEL 200 OWNERS. WE WILL REMOVE THIS NOTICE THE MINUTE MORE BECOME AVAILABLE AND UNFORTUNATELY WE HAVE NO IDEA WHEN THAT WILL BE. UNTIL THIS NOTICE DISAPPEARS PLEASE DO NOT REQUEST REEDS #25-#48. OUR SALVAGE YAMAHA KEYS INCLUDE SPRINGS!!! Very unique electric piano by "Electra-String, of Chanute Kansas. Unlike a Rhodes that uses tines or a Wurlitzer that uses reeds, this piano is a "real piano" with "real piano action and real strings". Very unique electronic piano that uses a real harp, loaded with real stings. Sort of a precursor to the famous Yamah CP-70 and 80. The piano works great and sounds pretty good. A previous owner has installed a 'Damp Chaser', de-humidifier to. Has been well taken care of. This keyboard is large and heavy. Measures 41.5" wide, 21" deep and 31" high (when set-up) and weighs ~150 lbs. Prefer Colorado Springs located Pick-up, but if you really want, we can likely assist with shipping arrangements. For the studio that has everything. A 25 key model, Made in the USA, Jaymar acoustic child's piano. Perfect for those eerie "Horror / Surreal" sound tracks. This thing is in great condition and plays in well. We checked it with our bench tuner. All keys and notes work w/ even volume. As far as note accuracy we found that overall the piano is about a '10 pennies' sharp and only found 2 notes with issues. The lowest D is 'flat' and the highest G# is 'flat'. We adjusted / moved the entire sound board / tine / tone bar assembly in and up, to play with a "soft-touch" and results in a quicker action and slight increase in volume / output. (originally these childs pianos have action that lends itself to sticking keys when played softly as they were designed for kids to "bang-on"). We also replaced the 'nails' that the sonic critical parts were assembled with screws, which improves sustain and volume. All original. Original vinyl grain wood cabinet still in fine shape. Will record great! Ready to go. Measures 17" wide x ~18" high x ~10" deep and weighs 10 lbs unpacked.